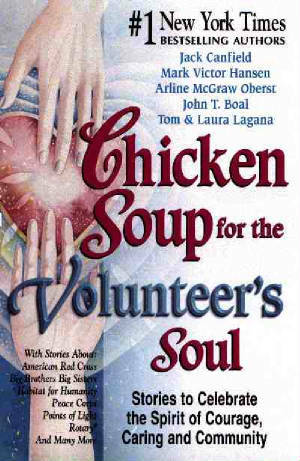 June 30, 2002 --- Elaine Ingalls Hogg, a volunteer for the last 15 years with the Strait Richmond Palliative Care Society, will have her story titled "Little Changes" published in Chicken Soup for the Volunteers Soul, scheduled for release on July 15, 2002. Out of 6000 stories, poems and cartoons reviewed from around a world during a two-year period, Elaines work was one of 87 entries selected for the book. Stories are included from such leading volunteer organizations as the American Red Cross, Big Brothers Big Sisters, Habitat for Humanity International, Muscular Dystrophy Association, Peace Corps, Rotary International, Special Olympics and The Salvation Army among many others. "Elaine's story celebrates the volunteer spirit that motivates readers into action," reports Tom Lagana, a co-author of the book. "All stories for our book had to satisfy our Mission Statement and Elaines was one of the select few that made it through to the final edit." The Mission Statement that drove the co-authors was "to publish the most emotionally compelling stories that collectively will become an international touchstone to inspire, encourage, empower or humble readers into reconnecting in their communities by volunteering selflessly in the service of helping others to not only add satisfaction and meaning in their lives, but also to prove that a single, caring individual can make a significant difference and have a positive impact toward a more equitable, civil and peaceful world." A portion of the sales of this book will be donated to the Points of Light Foundation, "America's Address for Volunteering." To connect people with year-round opportunities to serve, the Points of Light Foundation, the Volunteer Center National Network and the Connect America National Partnership established the "Seasons of Service" program. For more information, call 800-VOLUNTEER. During the past several years Chicken Soup for the Soul and its publisher, Health Communications, Inc., have contributed more than $6 million to charities that help make a difference in the lives of others. This book is the latest in the Chicken Soup for the Soul series, which has sold more than 65 million copies worldwide since 1993the year motivational speakers Jack Canfield and Mark Victor Hansen created the popular series which now has 54 titles and has been translated into 36 languages. Nineteen of the titles hit The New York Times and USA Today bestsellers lists. Seven reached #1. In addition to Tom Lagana, other co-authors of the book include Arline McGraw Oberst, John T. Boal and Laura Lagana. For more information, call Paola Fernandez Rana at Health Communications, Inc. at 800-851-9100, ext. 217.